The Philadelphia Union, also known as The U by fans, is a Major League Soccer (MLS) team from Chester, Pennsylvania. They are part of the Eastern Conference of the MLS and have been playing in the league since 2010 as an expansion team. Their home ground is the Talen Energy Stadium. The head coach of The U is Jim Curtin. 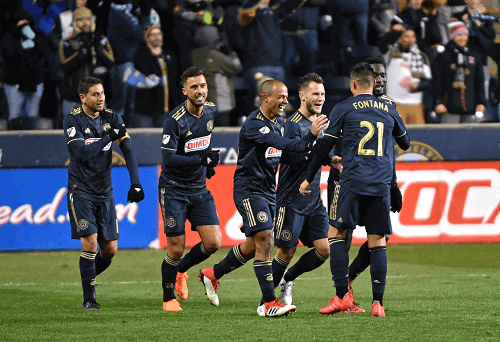 Read on for more on the Philadelphia Union, their performance history in the league, and which sportsbooks are the best for betting on the Philadelphia Union. Philadelphia wasn’t represented in the American soccer industry despite the city being one of the ten largest metropolitan areas in the country. There were attempts in 2001 and 2006 to establish an MLS team in the area but those fell through. The Union was founded in 2008 after the Sons of Ben supporter group showed the MLS there was an established fan base in the city. The Union joined the MLS as an expansion team two years later. Supporters of The U, Sons of Ben, have an anthem for the team called “I’m Looking Over a Four Leaf Clover”. The Sons of Ben, named after Founding Father Benjamin Franklin, are on of the larger Philadelphia Union supporter groups. There are five other smaller supporter groups. The Union’s home kit is navy blue with light blue and gold stripes. Their away kit is white with navy blue and gold stripes. A good soccer club isn’t complete without rivalries. The Philadelphia Union have rivalries with D.C. United and the New York Red Bulls. The history behind the rivalries goes back to geographical closeness and a traditional hostility between Philadelphia, New York City, and Washington D.C. in other professional sports leagues. The Union’s performance since they entered the MLS has been mediocre. They failed to qualify for the league in 2010, 2012 to 2015, and 2017. Furthermore, they made it to the conference semi-finals in 2011, and the knockout round in 2016 and 2018. However, they’ve fallen just shy of victory in the US Open Cup, making it to the finals three times in 2014, 2015, and 2018. Finally, they are still yet to qualify for the Confederation of North, Central American and Caribbean Association Football (CONCACAF) Champions League. Fans of The U are desperate for some silverware and the odds of them breaking their losing streak look good. Bear in mind that the Philadelphia Union tend to struggle in head-to-heads with teams from the Western Conference. Don’t be tempted by the higher odds unless you’re absolutely sure about the Union’s system and tactics.